In business, time is money and wasted time is a loss of efficiency and therefore a loss of value. There are great tools for creative businesses and wedding planners to use to organize schedules, set tasks, errands, and due dates. Many online project management tools are very affordable and can help to keep track of all the projects and ideas swirling around in your creative mind. When you become a wedding planner you discover pretty quickly that you need to plan every minute in the “Run of Show” or “Day Of” Event Timeline, as well as the months leading up to the event. One of the most important skill sets a professional wedding and event planner must have is planning, organizing, and managing the timeline and resources to help get everything done, both on time and in the order in which it must get done. Day Of Timeline – Day of the Event, including set up and run of show. An effective day of schedule helps to ensure the success of the event runs as planned. All the planning and hard work you put into a wedding all comes down to this one day. It feels like a lot of pressure; however having an effective day of schedule helps to ensure the success of the day’s events. Bad news alert: you can’t know for sure what might go wrong on the day of the wedding. The Good news is with an effective timeline you can include room for incidentals and set yourself up with reaction time to handle issues that may arise. Assign the bride an extra 30 minutes more than she says she needs for hair and makeup. Help the couple see the advantage in taking their portraits and wedding party pictures before the ceremony. Plot the key tasks, events and times then begin to work back from the end of reception to the start of the day; build the timeline upwards. Add the hard deadlines, like contracted reception hours and the ceremony start time then fill in the other details and work backwards to get a true start time. When you figure out the schedule then insert vendors where needed for arrival, set-up, and breakdown times. This sometimes might mean having to adjust the initial contracted times. This sometimes might mean the couple has to pay more money for additional time which happens occasionally with the photographer, videographer or limo company. Have a plan to call vendors an hour before they arrive for their service to confirm they are running on-time. For instance if the makeup artist is meant to arrive at 9:00am call her at 8:00am to make sure she is on her way and if she is stuck in traffic or is experiencing any other delay you have reaction time to move something else on the the timeline around so the schedule for the day is not affected. It is hard sometimes to convince the couple to commit to an early schedule because they think they have all the time in the world on the wedding day. Draw up your proposed plan and share it with them and help them see that time is needed. Email the wedding party directly with the timeline details. They are less likely to push back coming from the planner instead of the bride. Make sure you stress time to them. Make sure your team is cognizant of the timeline throughout the day. It is their responsibility to help the wedding party make sure things are on schedule and assist them in areas of need like packing up items. Make sure you account for time for check out if the couple and wedding party are staying in different locations the night of the wedding. Always advise for the entire wedding party to get ready in the same location/hotel. Account for transition time; this is very important. Keep in mind the size of the party. Don’t underestimate time. There is no rewind. Be flexible on the day to make changes. Over communicate the expected arrival times to all vendors and stress the time with the wedding party. Create a Master Timeline – 12 months out to day of and even day after. Confirm vendor arrival times the morning of the event and again 1 hour before they are scheduled to arrive to confirm they are still on schedule. 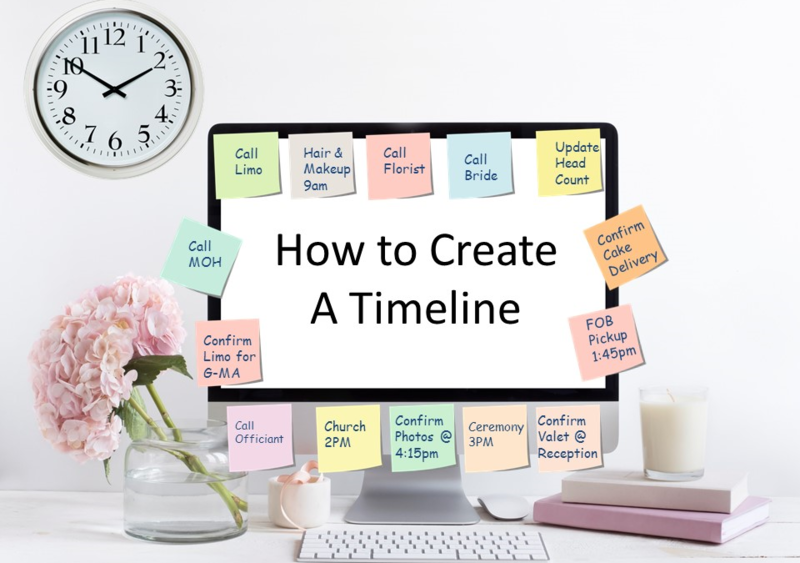 Make sure all vendors and bridal party members have a copy of the timeline and where they should be at all times. The critical path method (CPM) is a project modeling technique developed in the late 1950s by Morgan R. Walker of DuPont and James E. Kelley Jr. of Remington Rand. Logical endpoints such as milestones or deliverable items. This determines the shortest time possible to complete the project. For example: Event production timelines should prevent a common mistake such as tables being set before the right linens have been steamed and placed on the tables. This is a common mishap in the hotel industry as hotels supply basic linens but many clients upgrade to linens from an outside third party vendor. When the new linens arrive many times the hotel has already set all the tables for the event and the planner and staff need to remove all the china, flatware, and glassware only to dress the tables with the linens ordered by the client and re-set the tables. Planning a timeline saves time, mishaps, headaches and your reputation. I hope this information is helpful when planning your next event.